Months removed from Britain’s Brexit vote and just days before the U.S. presidential election, IU School of Global and International Studies Founding Dean Lee Feinstein took part in a half-day Chicago Council on Global Affairs program examining a driving force in both of those events. “The Rise of Populism: Expected or Unexpected?” sought to provide some depth to those movements during the discussions held Oct. 24. Dean Feinstein took part in the panel specifically focused on Brexit and the U.S. election, examining parallels but also discerning under-examined reasons behind the populism that drove Britain’s departure from the European Union and similar forces in the U.S. Joining him on the panel were Dina Smeltz, senior fellow for public opinion and foreign policy at the Chicago Council on Global Affairs, ​Constanze Stelzenmüller, the Robert Bosch Senior Fellow on foreign policy in the Center on the United States and Europe at the Brookings Institution, and ​João Vale de Almeida, the EU ambassador to the United Nations and former EU ambassador to the United States. Feinstein said from his perspective having served as U.S. ambassador in central Europe t and from what he just heard in a recent trip to Europe, the forms of populism don’t necessarily follow political lines and vary by geographic location. Understanding why populist movements are on the rise,” requires viewing it from these specific perspectives,” he said. 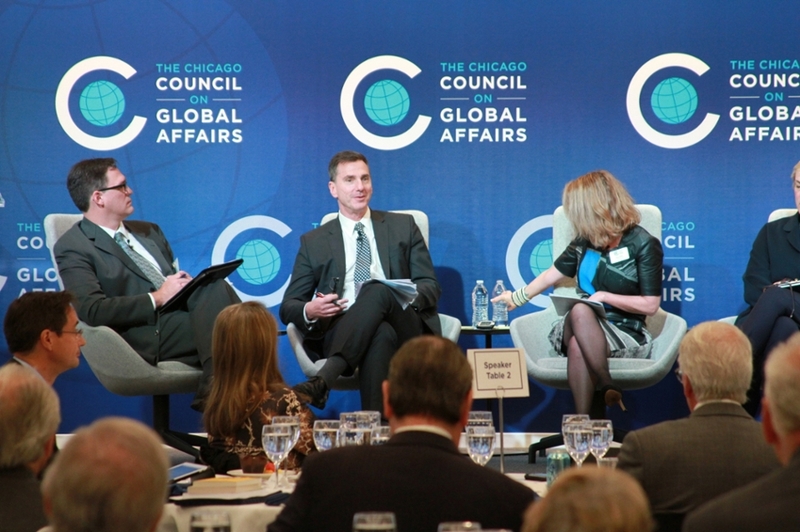 A full video of program is available on the Chicago Council on Global Affairs YouTube channel. Feinstein appeared at the Chicago Council event just after returning from giving two conference presentations in Europe. He and Tod Lindberg, senior fellow at the Hoover Institution at Stanford University, discussed atrocity prevention during an event in Berlin co-sponsored by the work on the subject, “Allies Against Atrocities.” Feinstein and Lindberg also spoke at the German Marshall Fund offices in Warsaw during a conference on U.S. elections.